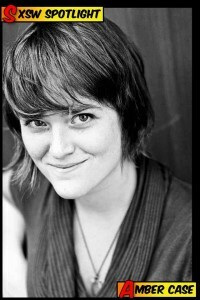 Amber Case is a cyborg anthropologist, founder of Geoloqi, TED speaker and the Sunday keynote at SXSW Interactive. Here, she shares with the TXSW blog how she found mentors by reading biographies and encourages us all to ignore statistics. All my life I’ve made up mentors, picking people from history or biographies I read as a kid. I’d copy aspects of their lifestyles, their thoughts and opinions and how they approached life. Don’t miss what will surely be a provocative keynote from Amber – 2 p.m., Sunday, March 11. Reading about Richard Feynman reminded me to be less serious and have fun. Paul Erdos reminded me to have an intense amount of energy. Carl Sagan encouraged me to take difficult subjects and explain them to a wider audience, no matter how much it might bother academia. I tend to ignore statistics, too. For instance, the percentage of people who raise venture funding at a certain age might be very small in reality, I tend to make a model in my mind that everyone has already done it, and that I’m very far behind. This helps to make it seem like what I’m doing it perfectly normal and not a big deal. Don’t miss what will surely be a provocative keynote from Amber – 2 p.m., Sunday, March 11. If you are in Austin for SXSW Interactive, we’d love to have you at the Tech Superwomen panel on March 10! i never thought of the books i read of others lives as “mentorship” in another form. this post has me rethinking it because so many biographies have taught me key lessons (mandela, cleopatra, zamperini and others). thank you for opening my eyes to a new way of looking at the books i read. Powerful profile on Amber Case…thanks for posting! I can really ID with her. Reading has done much the same for me. Recently I’ve experimented with a creating a lunch/learn session around the works of authors that had that kind of “mentoring” effect on me. Realizing many don’t read much I’ve decided to create a fun reason for others to pick up a book…and share the wisdom. It’s early in this experiment…but the first prototype is promising!